Rented a Dodge Ram pick up yesterday and headed out to the desert. No CD player. The low point had to be east of Pearblossom in the middle of nowhere with nothing but a 38 Special rock block to listen to. Hold On Loosely has been earworming its way into my skull since, breaking me down like my own personal Room 101, southern rock. Freedom is slavery, war is peace, you see it all around you, good lovin’ gone bad. The high point musically was…well, there was no high point. A lot of high desert hard rock and ranchera. We had dropped by Charlie Brown Farms in Little Rock for a date shake, then the long drive out to Barstow. The desert is great from the cab of a climate change special, you feel like Mike Dukakis in a tank. 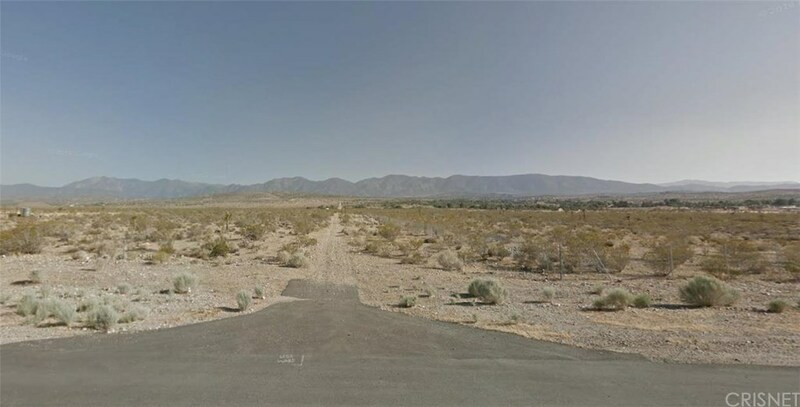 I watched the ruins of Job Harriman’s Llano Del Rio disappear in the rear view mirror, probably the only time all day I thought about politics. The 18 was closed, and they dog legged us along the 138 and then up another desert road to rejoin the 18 near Phelan. They farm a lot of meth out in Phelan. Cook it right on the rocks. A guy explained it to me one night, unbidden. I don’t think he had slept in years. 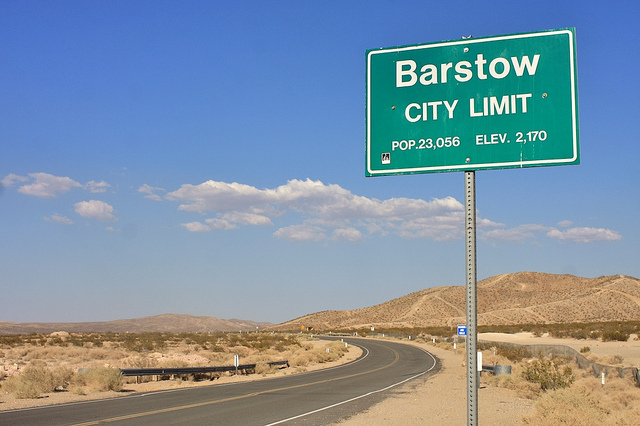 We passed through Barstow, picked up the 40 for a couple miles and got off at the Calico exit. Calico Ghost Town has been a slow favorite since I first went there when I was a kid. Hell, that was over half a century ago. Back then I thought it looked like a less fun Knotts Berry Farm (apparently Walter Knott had grown up in Calico, and used the proceeds from the mine to recreate Calico in Buena Park) but I didn’t know then that you could take your beer right on the train. 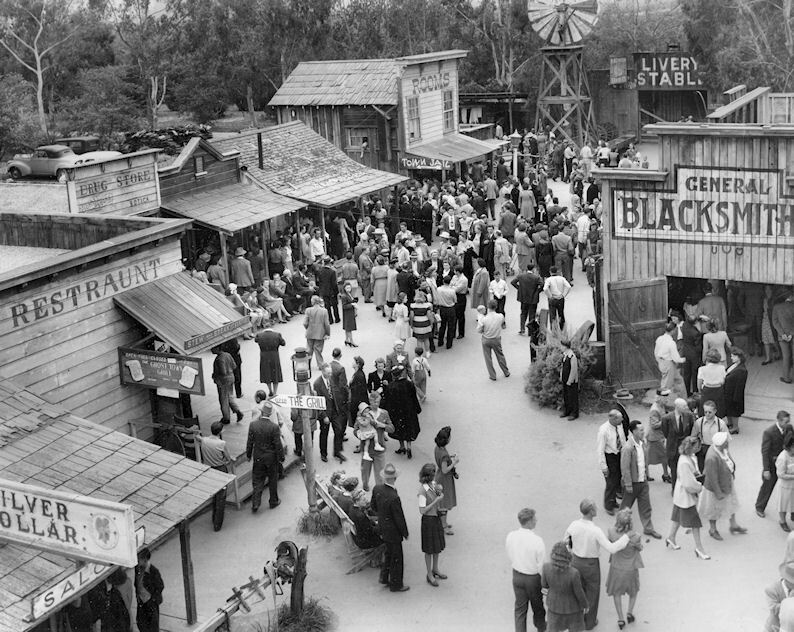 Doubtless some of the appeal for me is how the old pre-Snoopy Knotts Berry Farm was cloned from the place, somehow redolent of ancient times in Southern California. Fantasy world and Calico girls I’m coming back. But to be honest my single favorite thing there is the extraordinary display of tortured seismology looming over the parking lot. Sedimentary layers bent all which ways, even straight up vertical. It screams earthquake, but all you hear is desert silence. After Calico we went over to Rainbow Basin Natural Area, the reason for the pick up truck and 38 Special, it was perfect for driving the back roads. Not a bit of pavement in the place, just badlands bisected by narrow twisting graded road, gullies, loose rocks, and the occasional diamondback rattler. It is a perfect riot of geology, the land eroded for so many eons was absolutely gorgeous. This was once–actually several times–a large Miocene lake bed. Winter rains carve it anew every year, and tectonics torture the area–there’s a syncline to die for–though the black layers of ash are from better days, when nearby Amboy and the Cima Dome were alive with volcanos. Nearby are layers packed with fossils–most of the large mammal fossils you will see in our local museums that were not plucked from the La Brea Tar Pits came from the Rainbow Basin and thereabouts. 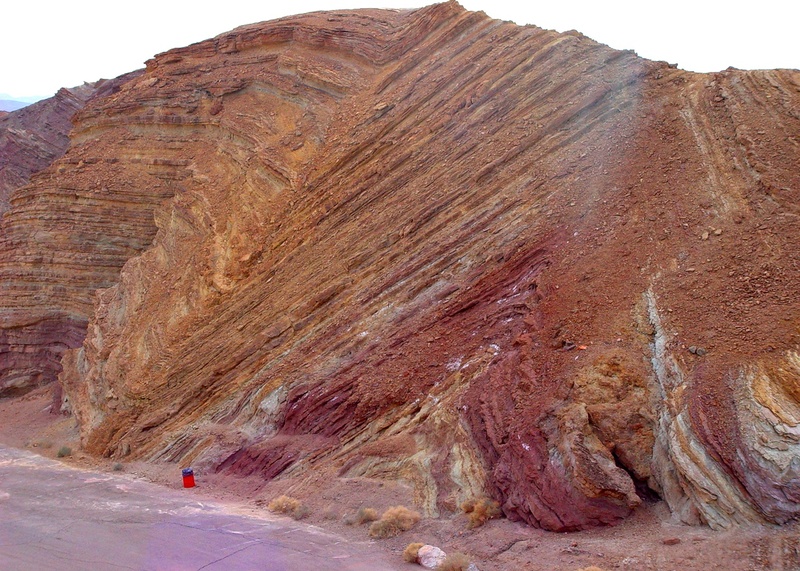 The striations are vividly colored, everything from deep sandstone red to a brilliant green clay. So many colors, it would be a ball high on psychedelics and not driving or being way too old and epileptic for that kind of thing. Somewhere in the middle a Foreigner rock block came on and I turned off the radio. There was no other sound at all. Not a bird, not a bug, not even a breeze. Nothing. After a glorious couple hours in Rainbow Basin, we tooled back on down Irwin Road towards Barstow in our giant pick up truck, trying not to go too fast. It’s the hemi, I explained to the wife, just to actually use hemi in a sentence. We hopped a left onto Old Highway 58 for Idle Spurs, still my favorite steak house ever. Incredible steak and a couple Jamesons. (You can pretend I took a picture of our food here.) We took our time eating, thoroughly enjoying it, and it was nearly dark as we climbed back into the cab of the pick-up, a little too late to drive all the way home on the 66. I love that old trestle across the Mojave, linking the two sides of Barstow, north and south of the tracks. Nearby was the old Harvey House, and I can only imagine the disappointment of Judy Garland fans who pilgrimage here. For a moment I thought On the Atchison, Topeka and the Santa Fe was going to stay in my head forever, like The Trolley Song did one terrible year after hearing it on a Palm Springs radio station twice in one weekend, but it disappeared back into the closet. We turned right onto the 66 and as we headed west Barstow faded into Lenwood and then into nothing. It was too dark for sightseeing, and the excursion was nearing the twelve hour mark anyway, so we made for the interstate. All seemed perfect, the last of the light disappearing behind the mountains as we got back on the 15 heading south, nestled contentedly in the cab of our gas guzzling monster truck. There was just the night, the road, and us. There is something profoundly reassuring about driving through the desert in the dark, just you and the wheels and the stars. Then a rock block of Boston interrupted my philosophizing. Egad. People livin’ in competition, the singer complained, and all he wanted was to have some peace of mind. Bad seventies memories came flooding back and I realized that I was entering my 59th year to a soundtrack of lame classic rock. I hate these songs, with all their inane lyrics and uninspired riffs and soulless guitar solos. Can’t I find any good driving music out here in the desert? More Than a Feeling came on, and as the singer watched Marianne walking away, away, awaaaaay, I asked the Lord in a moment of existential crisis why, oh why, had He forsaken me. The Lord let the guitar solo finish before answering. The desert is beautiful but cruel, He said, like good lovin’ gone bad. This entry was posted in All kinds of music (except jazz and punk), Autobiography,memoirs and confessions, Places, Story telling and tagged 38 Special, Barstow, Calico, Dodge Ram, Hang on Loosely, Harvey House, Idle Spurs, Judy Garland, Knotts Berry Farm, LLano Del Rio, Mojave Desert, Rainbow Basin. Bookmark the permalink.